Its A Quilt Book Extravaganza! Between my old and the ones from the library, I got my creative muse working again (take that, you vacationing harpy!) Since I had them all on my desk, here are reviews of the ones I narrowed down my creative button pushing to. None of the patterns will be copied verbatim, but they gave me the mental wherewithal to pull out my pencils and get to work! Kaffe, and I couldn’t be happier. I don’t use them exclusively by any means – but sometimes the “POP” of a Kaffe is just what a quilt needs to make it magnificent. This book was photographed in the Cornish estate of Port Eliot, the home of Lord and Lady St Germans, and the landscape is nearly as gorgeous as the quilts! This would be a perfect coffee table book, even if you don’t quilt but love magnificent photography. Amazing. The patterns themselves are fairly simple – all the better to show off Kaffe’s amazing floral prints. This is a Terrific book for large scale prints! I especially like “espania” with its blend of stripes, florals and feathers! “Misty Log Cabin” is a simple log cabin block quilt utilizing lovely pastels and greys give a stunning colorwash effect. “Double Diamond” is another that truly appealed to me with its simple design. A common quilt raised to excellence by the use of color and amazing fabrics. There are twenty patterns, all simple, but all stunning. My overall favorite, besides “espania” is “Meadow Pathway” – simple 60 degree triangles turned into something amazing! I think the “Arcadia” would be amazing with this quilt! COLOR!!! Color color color color. . . . I LOVES ME SOME COLOR! And Rebecca doesn’t disappoint. 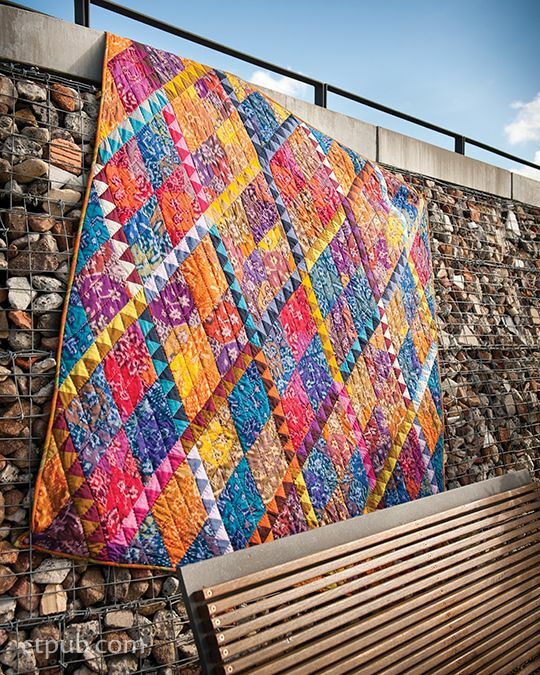 These truly are ‘rainbow’ quilts, from “Wavelength” – the cover quilt – to “Huckleberry”, a take on the old fashioned hexagon quilt taken to a modern, prism level. Hexagons pieced into diamonds, groups of four pieced into larger diamonds. What makes it particularly stunning is the use of medium, light and dark values for a true prism effect. Awesome. The best part for people who like quilting more than piecing? The amazing field for showing off AMAZING quilting. 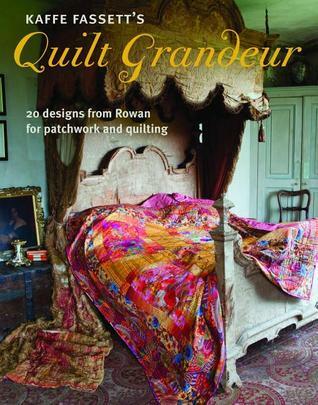 The quilting of the one on the cover is a knockout! My favorite, though? “Lucy in the Sky” uses black and white, and white and black, polka dot fabric in a traditional Ohio Star block with paper-pieced rainbow squares on point. Drool drool…. Yep, that one is going in my stack with my hand dyed fabrics and my whole BOX of black and white fabrics! 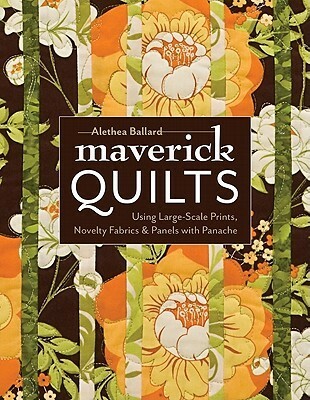 Have you ever drooled over a book for a single quilt that just called your name? That is “Adding Layers” for me. Well, two quilts really. “Lily Fields” is a simple Carolina Lily – but so much more! A medallion lily is surrounded by a multiple lilies in graduated sizes, banded with gorgeous greens. Stunning, and drool worthy. Again, by using simpler patterns in new ways, Kathy shows off many of the absolutely amazing fabrics available to quilters today. And as we all know – there are a million of them. My second favorite? “Ikat Diamonds” shows off the new (and ancient) middle eastern weave and colour of Ikat fabrics and shot cottons in simple diamonds surrounded by sawtooth borders. For something so simple, the results are breathtaking. There aren’t a lot of “this is how you quilt” instructions, which is all to the better in my mind. Instead, she spends a bit of time on rulers (believe me, I couldn’t live without my rulers!) then gets right into the quilts. 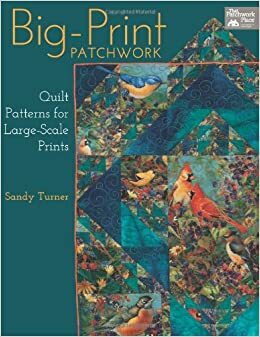 If you are looking for ideas for large scale prints, this is another great book. 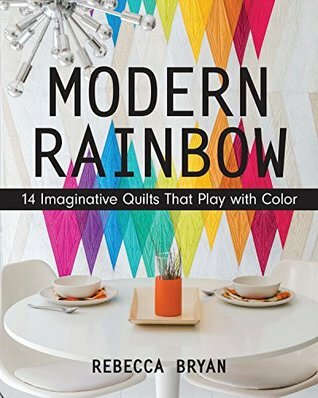 There are simple patterns for someone who wants a “this is how you do it step-by-step” quilting book, but it also gives a wonderful overview of using color and design to turn something simple into something spectacular. I was tempted to give this a 2-star review. Why? Well, first it is $18.99 for a 34 page booklet. Uh. No. Library works! and-white drawings. And her work is really beautiful. But this is, first and foremost, a drawing manual. A good enough one, based on continuous line drawing for quilting, but it is all about drawing. If that interests you, check it out at the library before spending this much money on it. I have a lot of time spent doodling – if you don’t this will help you learn how. Only 48 pages long, this isn’t a huge book, but it IS huge on helping you start your thought process on how to work with large print fabrics. I bought this several years ago, and just made a quilt for my bed based upon the book at the end of last year. 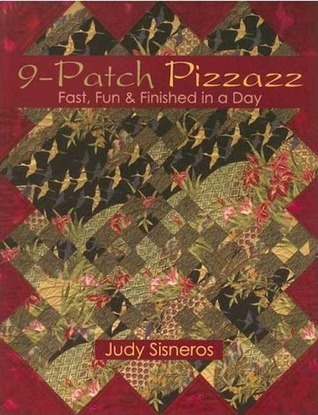 I got Judy’s 9-Patch Pizzazz: Fast, Fun & Finished in a Day after seeing it in my LQS. It had some fun, simple patterns in it, with ideas for using those ideas to create other quilts based on the basic idea. To be honest, I am a long-time quilter, with a depth of experience, and have designed quilts myself for many years. However, I have a stash of large prints that I had not been able to come up with any ideas for, and was frustrated. 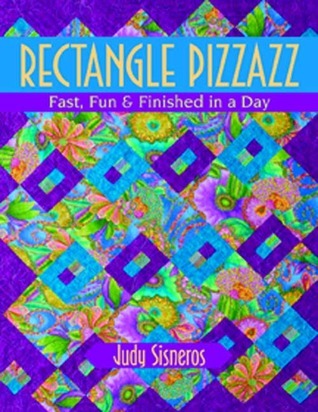 My work usually is based on applique, and I wanted something quick and easy, so 9-Patch Pizzazz: Fast, Fun & Finished in a Day was an investment in ‘what to do when I have quilter’s block and just want to make something fun’. This book doesn’t have it same feel as the first one. It feels more rushed, and less like something she enjoyed writing, as compared to the first one. It wasn’t as creative, and her fabric choices were less than stellar. It isn’t bad, but not up to her capabilities. It felt more “rush rush to get it to the printer” than anything else. Meh. OK, I hate to give bad reviews – but Maverick Quilts does not deliver what it promises. 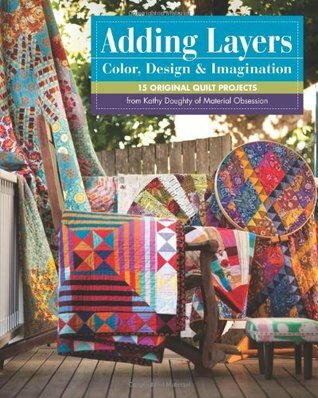 Most of the book is “how to quilt” rather than what it advertises, which is creative methods to utilize those wonderful large-scale prints. I have several large-scale prints that are absolutely amazing, and to cut them up into tiny pieces is less than optimal to be able to truly enjoy how gorgeous they are. So, I went book shopping. There are a few out there that are truly gorgeous, and embrace the concept of showing off your prints. This one, not so much. The author uses large scale prints mostly for borders and plain square or rectangular blocks interspersed with very simple stripped blocks cut apart and resewn into stripped or Drunkard’s Path squares. The fabrics are “mushed together” ala Kaffe, but without the punch and pizzazz he gives his quilts. 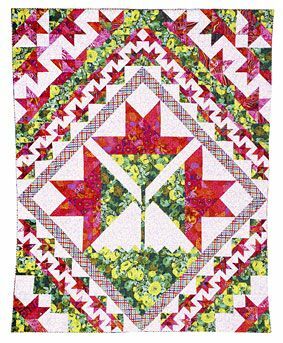 “Fly By the Garden” is simply rectangles of various large scale florals with a large border of the same fabrics sewn together into various sized squares and rectangles. The one quilt I did enjoy is one I have made before from other books. She calls it “Superstars” and it uses an 8-point star, a four, six and nine-patch block, a quarter-square and a paired quarter-square. 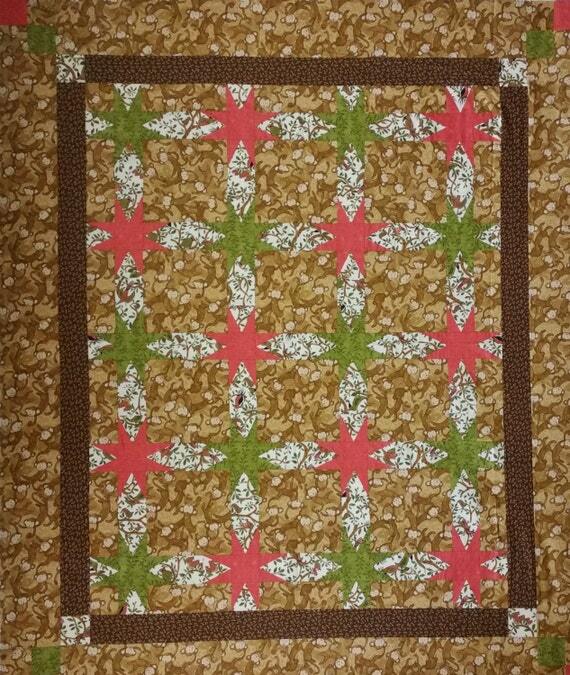 It is a very simple layout, and quite a common quilt, but utilizing larger scale prints. The main blocks are 6 1/2″ by 6 1/2″, so it doesn’t really give you a lot of room to fit “larger” print fabrics. But still, her use of prairie points at the edges of the ‘focus’ blocks is innovative. Overall? There are a lot of better books out there. Such as the next book on my list! The honest “good-and-bad” of it all, because that is what you need in a review, right? 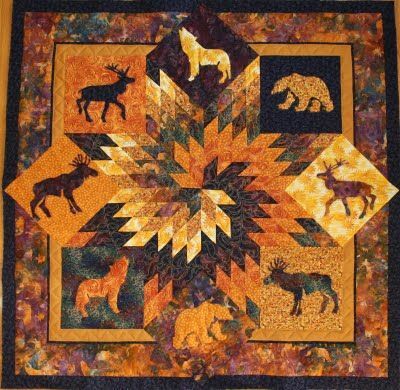 There are some gorgeous quilt photos of some really stunning quilts. There are several block ideas in the back, along with finished block sizes. The book utilizes very simple blocks – Twist, Snowball, Birds in the Air and Rail Fence. There is a short and sweet instructional with drawings on how to make easy-peasy half-square triangles. 80 pages. $21.77. Urp. I have given up on buying these tiny books for that much money. Can’t do it. So, Library it is. I am a sucker for large format print fabrics – oriental, floral, you name it, I have a stash full of it! What a pleasure to find a sweet little book to kick-start my brain on what to do with all this beautiful fabric without having to cut it into tiny pieces. I first met Jan Krentz several years ago at the Sisters, Oregon Quilt Festival. If you haven’t been? You GOTTA go!!! 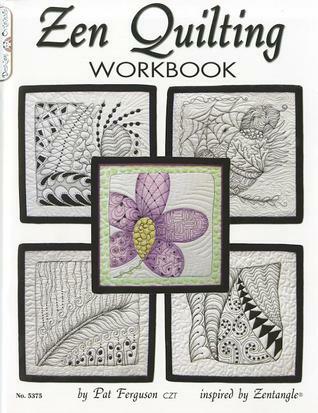 She taught a class from this book on Lone Star Quilts from this book. (My copy is signed – Yea!) She was a wonderful instructor. And the best thing? The teachings in her class follow the book in the same sort of well-laid-out, thoughtful, clear language that makes this sometimes hard-as-heck quilt to make almost easy-peasy-eggs-and-cheesy! Quilt to right posted by Jan the Quilter. If you want to make your first, or fiftieth, lone star, I can’t recommend this book highly enough! OK, here is my sad little secret. 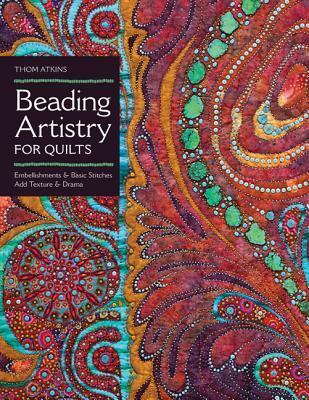 I really, really want to bead my quilts. I have buckets of beads that I have purchased for them. The thing is – they always end up looking just, well, goofy. But here? Here is a wonderful book that will help me with that very (to me) difficult chore! There are very clear, precise instructions (goodie!) about how to and why. I never knew that you should stretch your thread before beading – it keeps the beads from sagging off the quilt! There are beautiful drawings on how to knot your thread, on the four basic beading styles, and how to make picot edges. But what I like best? The photos! They are, in a word, stunning. My creative juices are definitely flowing now! 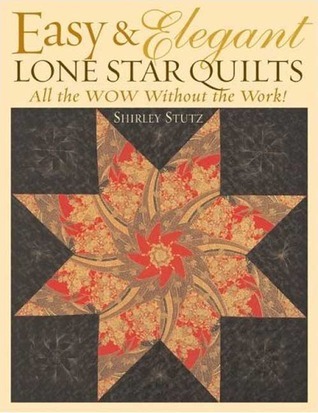 Easy & Elegant Lone Star Quilts: All the WOW Without the Work! I couldn’t agree more. Lone Stars can be, in a word, tedious as heck. 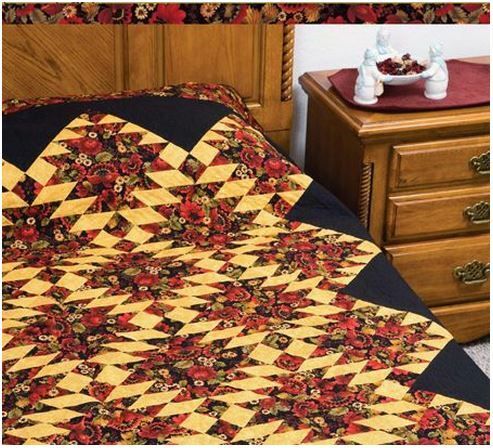 Even using quick piecing methods, lone stars can be completely frustrating – and you can end up with a ‘quilt’ that is shaped more like a bowl than anything else! This one allows you to pull out your favorite large scale prints and fussy-cut your way to something completely new, in eight fussy-cut pieces. Shirley gives you a very simple formula to make the quilt whatever size you want, whether to fit a particular use, or to work with the particular fabric you want to show off. It is AMAZING what you end up with depending on not only the fabric, but by simply moving your template around to hit different portions of the fabric! (My favorite of the whole book? “On the Prowl” – Tigers and Dragons!) You could literally make one of these a week and keep going for years, never having any one quilt turn out the same. Very nice. Very clear instructions. Well worth checking out. Copyright 2005, so it should be easily available. 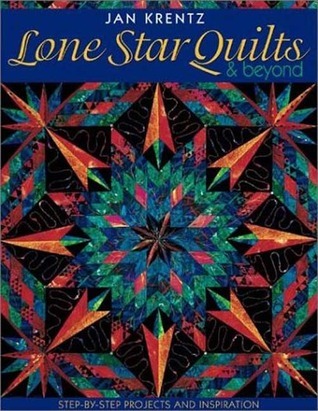 For those who want to make the more typical Lone Star, I would highly recommend Jan Krentz: “Lone Star Quilts & Beyond: Step-by-Step Projects and Inspiration.” I love that one. Very clear, very precise, with amazing results.